2012 Lionel #17 Nutcracker Loco, Tender, Baggage Coach Set. QX8211, QX12034, QX12001 - $50.00 : Olson Hobbies, Welcome To The Train Page! 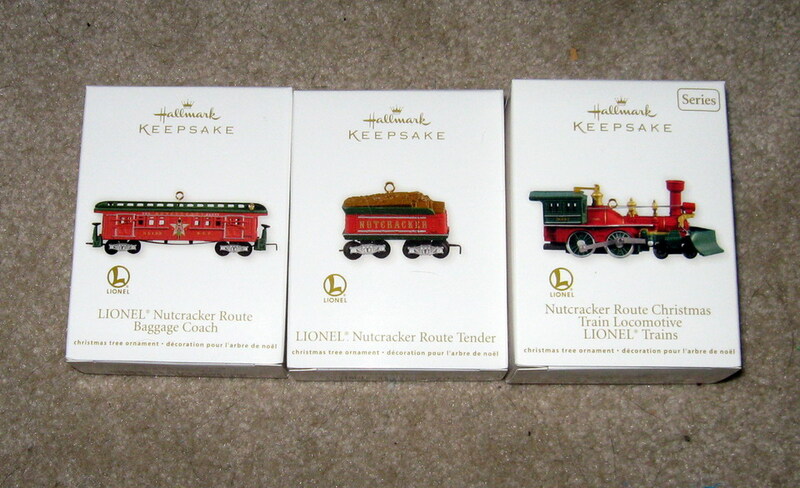 2012 Lionel #17 Nutcracker Loco, Tender, Baggage Coach Set. 2012 Nutcracker Route Christmas Train Loco, Tender and Baggage Coach. For generations, the sight of a Lionel train puffing its way around a Christmas tree has brought out the kid in young and old alike. This steam loco has a cherry red smokestack and a festive green snowplow up front. The tender comes with a pile high of wood for powering the locomotive, the baggage coach was with a clerestory roof, which handled baggage and carries both passengers and luggage. 17th in the Series for this ornament. The Locomotive comes with stock number QX8211, the Tender Stock Number QXI2034; and the Baggage Coach Stock number QXI2001. All pieces are handcrafted, wheels turn manually, crafted Die Cast Metal.